Stuck on homework? Get HelpNow! 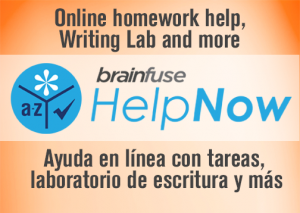 This fall, students have a powerful new tool: Brainfuse HelpNow is an all-in-one suite of tutoring services designed for a wide range of academic needs whether it’s tackling a tough homework problem, mastering a particular topic, or writing a paper. HelpNow includes expert academic tutoring and self-study tools to empower users to study at their own pace or collaborate with peers and teachers. Students access live, on-demand academic help and state-aligned skills building lessons from expert tutors. Tutors and students communicate in real time in the online classroom by typing, drawing, and marking-up lessons and web content. Plus, students have access to the Writing Lab to submit writing assignments to tutors any time of the day. You will also find a full-service test center with practice and diagnostic tests for all levels in math, reading, and writing as well as college preparatory tests – including the SAT. All you need is your WCCLS library card and an Internet connection to get Brainfuse HelpNow and jump-start your school year!